Fig 1. Compost windrow at a trout farm in the Goulburn Valley. Composting is simple, effective, and transforms the wastes generated on aquaculture farms into a valuable on-farm resource. Previously, disposal of processing wastes (e.g. heads, frames and offal) and fish mortalities generated on-farm has been by pit burial. 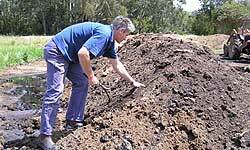 Composting wastes is consistent with best practice environmental management and is now a condition of Environment Protection Authority Victoria (EPA) waste discharge licenses. A practical and effective method of composting fish wastes generated by the local salmonid aquaculture industry has been developed at Alexandra in the Goulburn Valley and has been adopted by several local trout farms (Figure 1). This Aquaculture Note is a summary of the farm's combined experiences and recommendations. Environment Protection Authority Victoria defines composting as the controlled biological decomposition or treatment of an organic part of a material to a condition sufficiently stable for nuisance-free storage, and for safe and beneficial use in land applications (EPA, 1996). All composting facilities must conform to EPA and relevant State environment protection policies. The information in this Aquaculture Note is consistent with these policies.The EPA defines fish processing wastes as a prescribed industrial waste (PIW) and a composting facility which treats such material, regardless of its size, generally requires an EPA Works Approval and licence to operate. Composting facilities that treat waste generated on-site are, however, normally managed through an aquaculture farm's existing EPA licence. Before constructing a fish waste composting facility, location of the site and management of surface run-off, leachate, moisture, odour and dust should be considered. Processing wastes and mortalities must be temporarily stored and then transferred by forklift, tractor or truck to the composting facility. Sufficient space at the site is therefore needed for storage of raw materials (e.g. processing wastes, sawdust and mulched garden waste) and for movement of vehicles required for delivery, materials handling and disposal.The composting facility should be located a sufficient distance from work and residential areas to ensure protection from odours (EPA, 1996) and at least 100 metres from surface waters. Composting facilities should not be located on flood plains or in proclaimed potable water supply catchments unless adequate protection of surface and ground waters can be demonstrated.In addition, emergency vehicle access should be considered when choosing a site. minimising, containing and re-using compost run-off and leachate to ensure there is no discharge of contaminated wastewater from the premises. All water entering areas where composting activities are conducted must be regarded as contaminated wastewater and should be captured for re-use or disposal. The compost area should be located on an impermeable base (e.g. concrete or compacted low-permeability clay) that is graded to ensure runoff and leachate drains to a collection tank or pit of sufficient size to prevent overflow.Outdoor areas in contact with composting materials should have a bund in place to prevent runoff, leachate and solids from contaminating clean zones around the site, clean stormwater drains and adjoining properties. Runoff and leachate from composting areas may have a high biochemical oxygen demand and generate odours. A bund of fully composted material placed around compost heaps helps to absorb leachate/ run-off and divert stormwater away. Placing compost heaps upon a highly absorbent organic base will further minimise runoff. Maintaining an adequate level of moisture is necessary to promote microbial breakdown of the processing wastes while allowing oxygen diffusion through the material. Although water was used to transfer fish wastes into pits for burial, it is not required when wastes are composted.Water contained within composting sites must be considered contaminated and should only be allowed to accumulate in designated recycle tanks or pits. Pumping this water back on to the compost pile can assist in the maintenance of adequate moisture levels. Collected runoff and leachate can also be sprayed onto irrigated pasture, directed to a wastewater system or treated with aeration. The main cause of odour from fish waste composting facilities is anaerobic conditions within compost heaps. Odours can be minimised by incorporating these wastes into the composting process on the same day they are produced.Under aerobic conditions, the main gas generated from composting is odourless carbon dioxide. Under anaerobic conditions, odorous gases (e.g. methane and hydrogen sulphide), organic sulphides and volatile fatty acids are produced. Odour management, therefore, requires that aerobic conditions be maintained by regularly turning the compost heap or using ventilation structures.Odour can be further reduced by maintaining an appropriate ratio of carbon to nitrogen in the compost heap. This means using an appropriate amount of sawdust (or other material as carbon source) relative to the amount of fish processing waste and is discussed later in this document. Dust is generated by the movements of dry composting materials by wind, machinery, trucks and other equipment. Dust can be effectively managed by covering dusty materials with tarpaulins or applying a light water spray. Although dust production is unlikely due to the normally high moisture content of compost, its presence can be an indicator of insufficient moisture in the composting mass. As discussed previously, excessive water application should be avoided. Sawdust is an effective carbon source for composting fish wastes and may be available in the vicinity of many fish farms. Hardwood sawdusts absorb moisture less readily than softwood sawdusts so publications suggesting pine sawdust should be interpreted with caution. Woodchips are too coarse for use in compost as they are not absorbent and slow to decompose. Pine chips decompose quickly but need to weather for at least one year before use to reduce resins in the material. Using very fine sawdust can hinder adequate aeration and the mixture may clump. Alternative carbon sources include municipal green waste, hay and straw. The key considerations when choosing a carbon source are cost, availability and proximity of supply. The same volume ratio (one part fish waste/nitrogen-rich material to two parts carbon-rich material) is appropriate for most materials (see following discussion). At the simplest level and for very small volumes of fish waste, an ordinary compost bin can be used to effectively manage organic wastes. For premises that generate significant amounts of waste, larger facilities are necessary. When adding to or establishing new compost windrows, inclusion of some mature compost will provide 'seed' to ensure ongoing growth of fungus and bacteria. Fungi found growing under pine trees can be a useful source (as a guide, use two buckets of fungi per 10 metre length of sawdust is appropriate). Constructing a compost windrow begins by establishing a 200 millimetres thick base layer of sawdust or other source of absorbent material which acts as a source of carbon. 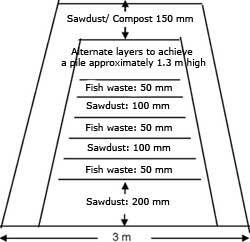 Upon this base, alternating layers of fish waste and sawdust are added in a volume ratio of 1:2 of fish waste to sawdust (Figure 2). Compost windrows should be up to 3 metres wide and be 1.5 metres high. When the full height of the windrow is reached, it should be extended lengthwise. New sections of the compost pile should be capped with a 150 millimetres deep layer of sawdust or mature compost. It is essential that all fish wastes are completely covered with sawdust and kept within the pile; regular raking of material back into the pile may be required. Approximately 2 tonnes of fish waste will create a compost windrow measuring 3 metres wide by 10 metres long containing four layers of waste. If abundant sawdust is available, using additional sawdust results in compost that is highly absorbent and can be re-used along with new sawdust in subsequent piles. It is, however, important to be generous with the new sawdust as a thick outer-covering layer will reduce odours, flies and birds. Seasonal effects can influence the relative amounts of fish wastes and sawdust required. In rainy periods, extra sawdust should be added to increase absorbency while slightly less sawdust may be necessary during dry periods. Fig 2. Schematic of compost structure. Compost windrows should be left uncovered to maintain aeration and suitable moisture levels within the pile. Depending on the structure of the pile and the type of materials used, unturned compost will sufficiently mature to spread over pasture or gardens in about one year. Turning the compost windrow three to four times will help maintain an even temperature throughout and will hasten the decomposition process. To reduce the spread of odours downwind from the composting site, avoid turning windrows on windy days. A temperature greater than 55oC should be maintained throughout the windrow for at least three consecutive days to prevent proliferation of pathogens (EPA, 1996; Australian Standard 4454-2003).If you intend to sell your compost you, should ensure you address all the issues identified in EPA Publication 508 (EPA, 1996). EcoRecycle Victoria; documents include the Summary to Guide to Best Practice - Composting Green Organics. EPA. 1996. Environmental guidelines for composting and other organic recycling facilities. Recycling organic material to benefit the environment. Publication 508. Environment Protection (Scheduled Premises and Exemptions) Regulations 1996. Statutory Rule No.66/1996. Environment Protection (Prescribed Waste) Regulations 1998. Statutory Rule No. 95/1998. US Geological Survey; Biological Resources. Windrow Composting as an Effective Method to Dispose of Large Numbers of Fish. Biological Information and Technology Notes. No 98-013. November 1998. Wytze Kylstra of Alexandra expended enormous resources, time and energy in investigating an effective method of utilising fish waste to create compost. His efforts, enthusiasm and innovations are hugely appreciated. Edward Meggitt of the Goulburn River Trout Farm supplied Wyzte with fish wastes, and provided relevant documents, encouragement and support. Robert Wood of Narangi Trout Farm adopted the process and provided valuable feedback. Elita Briggs, EPA Victoria, provided advice and support.